I despaired. The working part of being an adult was not on my list of favorite things. Over time, I got used to working every day, and learned to enjoy it. I made friends at work, was treated well and had a good rapport with everyone except for one person who I tried very hard to kill with kindness. 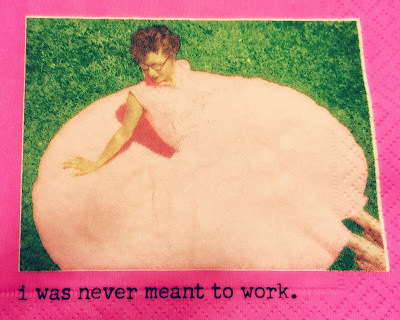 Eventually life took a turn and I quit my job (by this time just part-time) for a dual position, an even fuller-time job – motherhood and housekeeping. For a time, both jobs fulfilled me – although there’s a lot of downtime with infants at home, their growth demands more hours, and a house, well, there’s always something to do in a house – but after a while, I started to despair again. Is this what I went to eighteen years of school for? To change diapers and wipe dust off of surfaces? There has to be someone more qualified. After a while, I settled in. One baby was now two babies, and a house crumbles a little every year, demanding constant maintenance and upkeep. I was busy, and although my tasks were tedious, I learned how to mix them up to trick myself into thinking that I wasn’t doing the same exact thing Every. Single. Day. Sometimes, the old thoughts crept in: Is this really what I am doing? I watched friends and former fellow at-home moms launch themselves back into old careers when their children started attending school full-time. Some women went back to school to start new careers, and others got jobs to fill the hours before the kids returned home from school. My social circle of stay-at-home moms shrank, and I found myself alone a lot of the time. They were contributing. What was I doing? Should I be following their cues and returning to the workforce? The very idea of donning appropriate clothing for work filled me with dread. I considered that my jobs as mother and housekeeper were still valid – after all, I still had children, and the house required even more of my attention now that there were four fully-formed people running through it all hours of the day. I ignored that the women swirling around me now had new work to do, and put the idea of going back to work out of my mind. Through it all, I became close with God. I went to church and to Bible study and learned about the history of my belief system, nurtured my faith, and listened to other women utter words that were on my heart. Is this really what I’m supposed to be doing? I want to do something, but what? Am I doing enough? Am I wasting my life? I shared that I felt the same thing. Then, it clicked. God put me Here. Right in this spot, right in this very moment. Like my first real job, I was chosen to do this one, too. The only thing that needed to change was my perspective. God gave me this time, these children, this house, to work at nurturing and caring for and filling with the discipline of love. It might be non-traditional in our current culture, and it for sure isn’t compensated in any tangible way, but I can see the fruits of my labor every day in my family members and in our home. I no longer worry or stew about what I am doing with my life. I realize that I am doing it. My life is happening right now. God handed a job to me and I ran with it. Along the way I have learned that no matter how tedious or challenging the task laid before me, when I do it from a holy perspective, I am most fulfilled. When God is my focus, I do my job with an attitude of what I am to learn from him through it. I trust that when the time comes for me to change my career path, he will show me what to do. You are so fortunate you do not have to work to make ends meet. Not too many women do now a days in which we find ourselves living. I do believe however that this is the way God intended it to be. Women were to be the keepers of their own house hold. I believe this makes for a better marriage and home all the way around. May God bless you for this very important role as a wife and mother and housekeeper and etc. etc. The last two paragraphs brought tears to my eyes because they fit SO PERFECTLY what I am thinking and feeling and going through now. And I love your perspective - you don't need to worry about what to do because you're doing it! I love that. This uplifted me today. Oh how this speaks to me, Andrea. I have really been tormented this past year with going back to work, and that constant whisper of "Is THIS it? Am I supposed to be doing MORE?" SO many times this year, I have had those "Aha moments"- that made me think "This could not have happened if I was working." I whisper back each time, "Thank you God, I see now." Thank you, Brianna! I am encouraged by this more than you know. This really resonated with me. I struggle more with just not helping with the income much for the approaching college years for 3 kids. Like you, I've come to some of the same conclusions. You said it so beautifully! Thanks, Bonnie. I spent a lot of time complaining and wanting to be more more more. Eventually I saw that I was everything that I was supposed to be, and nobody was holding me back from realizing my true potential except for me.